A police vehicle drives past wreckage after a suicide car bomb attack on a government building in Mogadishu, Somalia, March 23, 2019. Al-Shabab gunmen stormed the government building after a suicide car bombing. 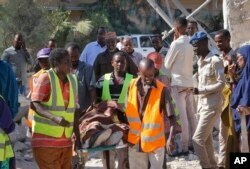 Somalis carry away the body of a civilian victim who was shot dead by gunmen during a suicide car bomb attack on a government building in Mogadishu, Somalia, March 23, 2019.